Lasagna (lasagne) Bolognese is a hearty Italian classic recipe with layers of fresh pasta, Bolognese sauce, bechamel sauce and Parmesan cheese. Perfect for feeding a crowd or freezing for future use. Last week I made a low and slow cooked traditional Bolognese sauce that is the main ingredient to this lasagna. There are just 4 ingredients to this lasagana, the meat sauce, a bechamel sauce (which is a simple white sauce), Parmesan cheese and fresh pasta sheets. I chose to use fresh pasta because it has a better texture than dried and you can cut through the layers so much easier with fork. I also like to make my own pasta, but many stores now carry fresh pasta that is very good. If you see sheets of fresh pasta in the refrigerated section of the grocery store I highly recommend using it. This is a well-stacked lasagna and feeds a lot. I am not stingy on the layers here because I don’t like a whimpy tower of lasagna on my plate. Look a the layers in the picture below! You will need a deep casserole dish for this lasagna recipe, 2-3 inches deep as there are 6 layers of pasta. You will notice that there is no mozzarella in this lasagna. But what is that on the top that looks like mozzarella, you ask? It is the béchamel sauce melted together with Parmesan cheese to give a gooey topping. This is not a travesty, this is because in Bologna Italy, where the sauce and the dish originates, they do not use mozzarella in their lasagna. Nor do they use ricotta, a white béchamel sauce is used instead. This lasagna is the perfect make ahead dish that freezes really well. If you want to make it and freeze in the dish (make sure it is freezer friendly) uncooked, just cover with 2 layers of plastic wrap and foil. When you are ready to bake, defrost in the fridge overnight and cook according to the recipe. If you want to freeze the lasagna after baking, allow it to come to room temperature, then cover with 2 layers of plastic wrap and foil, then freeze. Defrost overnight in the fridge then reheat in a 375°F oven, covered in foil for 30 minutes or until heated through. You can also freeze leftovers by cutting individual servings and freezing them. This way they are quicker to defrost. 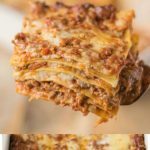 If you’ve tried this Lasagna Bolognese recipe or any other recipe on the blog then don’t forget to rate the recipe and let me know how it turned out in the comments below. I love to hear from my readers! Layers of fresh pasta sheets, Bolognese sauce, bechamel sauce and Parmesan cheese. Perfect for feeding a crowd or freezing. Cook the lasagna sheets a few minutes less than the package directions suggests (they will continue to cook in the oven). Drain the sheets and lie flat on towels to cool, then stack between sheets of parchment paper until ready to use. Set aside. To a saucepan add the butter over medium heat. When melted, whisk in the flour and cook for a few minutes until it turns a light golden color. Slowly pour in the milk while whisking. Bring to a simmer and cook for 10 minutes. Turn off the heat and stir in the salt and nutmeg. Set aside. Set all your ingredients up in a line, Bolognese sauce, lasagna sheets, Parmesan cheese and the béchamel (white sauce). Use unsalted butter to grease a 9 x 13 casserole dish. Spread a ladle full of Bolognese sauce over the bottom of the pan in an even layer. Line with lasagna sheets on top of the sauce, slightly overlapping. Spread an even layer of Bolognese over the pasta, sprinkle Parmesan cheese then a layer of béchamel sauce. Repeat, pasta, Bolognese, Parmesan, béchamel until all the ingredients are gone and the pan is full. The last topping being a layer of pasta with Bolognese and béchamel, top with Parmesan. Cover with foil, place on a baking sheet in case it bubbles over and bake for 30 minutes. After 30 minutes remove the foil and bake for 15 minutes more. Allow to rest for 30 minutes before slicing. You could use more to your liking. I have found that too much can make the lasagna too wet and soupy. I’m making the bolognese recipe for the 2nd time tonight and tomorrow I’ll be making this lasagna recipe, for the 2nd time as well. These recipes are amazing, I’ve made them my own this time around, but the recipes listed are initial starters and my family and I, LOVE! I just made a batch of the Bolognese yesterday and wish I was making lasagna today. Enjoy and I’m happy you love the recipe. Amazing! I could wish for more, it’s just so delicious! 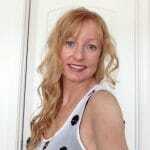 I love your clicks! This Lasagna looks so flavorful. Cannot. Stop. Drooling. Seriously, this looks AMAZING! Definitely need to try this soon! Hehe I am totally with you there, there’s nothing more disappointing than a tiny wimpy ‘tower’ of lasagne, especially if it all slides apart the minute it hits the table. Looks like you have no troubles like that with this recipe though! 😛 Can’t wait to make myself a true lasagne tower! I did not know that béchamel sauce was used in Italian lasagna instead of mozzarella or ricotta – thanks for helping me learn something new! This mile-high pile of lasagna looks amazing and I’m mesmerized by how good that layer with béchamel sauce melted together with Parmesan cheese looks! My taste buds could make friends with that picture of your delectable lasagna very quickly! Beautiful. Oh I think this must taste just like heaven! At the very least it looks divine! My family will devour this! The ultimate comfort food. Perfect for dinner parties too.